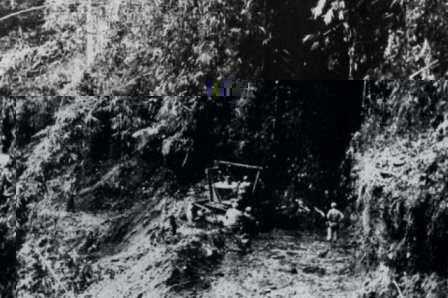 When the Ledo Road Engineers first hacked away at the jungle in December of 1942, they knew they were building a road to China. Exactly how and by which route it would get there, no one knew. The need for a road was urgent as the situation in China was becoming desperate. The Japanese invasion of Burma earlier in 1942 had cut the Burma Road supply line. There was no longer a land route for lend-lease aid to China. 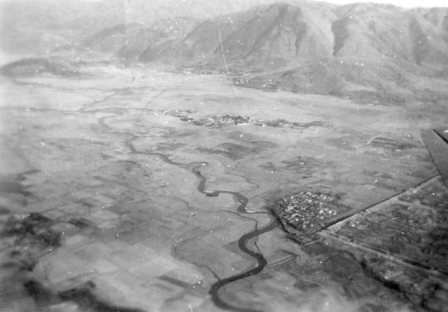 The U.S. Army Air Corps flew supplies to China to replace the lost land route. This route over the Himalayas was some of the most dangerous flying in the world. Over the course of the war, almost 600 planes and 1,500 airmen were lost. This route came to be known as "The Hump." This first ever organized military airlift was not sufficient, in the early days of the war, to bring everything that was needed to the Chinese. A road had to be built. Over the next two years the Engineers fought the jungle, mountains, rivers, monsoons, mosquitoes and the Japanese. They built a road through the some of the toughest terrain in the world. By November of 1944 they were within 80 miles of Myitkyina. General Joseph Stilwell's Chinese Army, with the help of Merrill's Marauders, took Myitkyina airfield and after a siege of almost three months, the city itself. Northern Burma was secured and the Ledo Road progressed past Myitkyina to the Irrawaddy River. Now a decision had to be made. Which way to China? There were several possible routes to be taken. Three received serious consideration. One route was Myitkyina to Bhamo to Tengchung. Known as the Taping Valley route or the "gold and silver trail," it was only considered because it was thought the Japanese might have improved some of it as a surfaced highway. Later aerial reconnaissance showed this not to be true and the route was dropped from consideration. Another route under consideration was one from Myitkyina to Bhamo to Mongyu and then Wanting. Favored by Corps of Engineers planners in Washington and by General Lewis A. Pick, commander of the Ledo Road Engineers, this route ultimately became that of the Ledo Road. Last was the Myitkyina to Tengchung to Paoshan route. Engineers referred to this route as "PTM" or the "Tengchung Cut-off." This route was favored by Engineers in Delhi mainly because it was 144 miles shorter than the route ultimately chosen. Distance was not however the only determining factor. The terrain along this route reminded many of that of the steep grades and winding turns of the Patkai Mountains. This proved to be a deciding factor. The Ledo Road would take the Myitkyina - Bhamo - Mongyu - Wanting route. 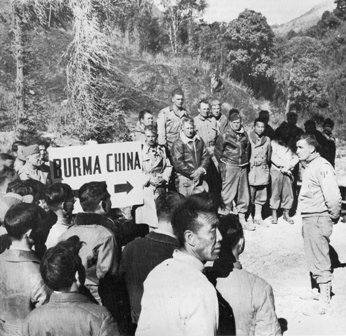 While the route of the road had been decided, General Stilwell was not at all confident that his Chinese troops would be able to take or even hold any area south of Myitkyina. For this reason, he approved a plan to develop the more northerly Tengchung Cut-off (PTM route) using mainly Chinese labor, assisted by American Burma Road Engineers. This decision touched off a controversy between Engineers and non-Engineers alike. Basically there were two camps among the commanders, those that favored the route through Bhamo to Wanting, and those that favored PTM. Both "camps" put their plans into action. Ledo Road Engineers continued the work began in Assam and developed the Road south toward Bhamo. Burma Road Engineers and the Chinese Yunnan-Burma Highway Engineering Administration (YBHEA) worked on the Burma Road and the PTM route. Although there were obvious questions, especially from the Chinese, as to why two routes were being built, construction continued. As the Ledo Road neared completion, plans were made for a ceremonial first convoy. General Pick departed with the convoy on the afternoon of January 12, 1945. There were plenty of correspondents, photographers and cameramen on hand to document the event. Some traveled with the convoy over the road and still more waited for it at Myitkyina. This convoy would carry the first supplies to reach China by land in nearly three years and that would be big news. The convoy was delayed twice enroute. Once for eight days at Myitkyina and again for three days at Namkham. Chinese and American units were clearing the last Japanese resistance from near the junction of the Ledo and Burma Roads. While General Pick's convoy waited, things were happening on the Tengchung Cut-off. Colonel Robert F. Seedlock's Burma Road Engineers, working from the east, and the YBHEA construction gang, working from the west, had linked up in late December of 1944. By January their road was passable for vehicles. At 3:30 PM on January 20, 1945, as General Pick's ceremonial first convoy and its compliment of correspondents waited in Myitkyina, a convoy of two trucks and a wrecker led by Lt. Hugh Pock, having made their way from Myitkyina over the Tengchung Cut-off, crossed into China. As onlookers of Burma Road Engineers and the YBHEA applauded, this convoy symbolically broke the blockade of China. The Yunnan-Burma Highway Administration passed news of the crossing to the BBC and Reuters. News of the symbolic first convoy was flashed across the globe, creating a public relations disaster for CBI officials. Forty war correspondents were with Pick's official first convoy, held up at Myitkyina. They were enraged at being stuck with the "wrong" convoy. The BBC and Reuters stories reportedly quoted the Supreme Allied Commander as having radioed Churchill and Roosevelt: "In accordance with the orders you gave me at Quebec, the road to China is open." Churchill, Chiang, General Wedemeyer, China Theater commander, and Lord Mountbatten, Southeast Asia (SEAC) commander, all publicly praised the event. The public relations damage was done. Two trucks and a wrecker are hardly much of a convoy and they did not carry any supplies for the Chinese. General Pick, although angered about it, made no comment on Pock's convoy and continued on with his own 113-vehicle long official first convoy. On January 28, 1945 they crossed the border into China. There were speeches and ceremonies by CBI commanders and Chinese officials. Correspondents wrote about the convoy and photographers and cameramen recorded it. Newspapers in the States carried the story of the first crossing into China via the Tengchung Cut-off. When the news of the official first convoy arriving in China was received on January 28th, many ignored it as "old news," having already run a similar story the week before. The story that climaxed the building of the Ledo Road was lost in a few inside pages of the newspapers. Many carried no word of it at all. opened land route into China. Their story might have been newsworthy if not for the fact that one was AWOL and their "mission" was nothing more than an adventurous joy-ride. The Tengchung Cut-off was never developed beyond a single lane mountain road, passable only in good weather. In many places it was not much more than a rugged trail, cut into the side of a mountain and reaching altitudes of 8,500 feet. The official estimate is that only 65 trucks ever used it as a route to China. Major General Gilbert X. Cheves, Commanding Services of Supply, China Theater, praised Seedlock and his Burma Road Engineers. He referred to the Tengchung Cut-off and the Ledo Road as the "China-India Road." The name never caught on, especially with the official renaming of the Ledo-Burma Roads as "Stilwell Road." Eventually, newspapers and magazines like TIME and LIFE published stories and pictorials of the Ledo Road and the men who built it. The American public learned of the great engineering feat. In a turnabout, these stories carried nothing about the Tengchung Cut-off and made little mention of the Burma Road Engineers.